The college town, one of America’s most appealing and unique features, grew out of the Age of Reason, and the concept of a regional, liberal-arts college nurtured by a small town has been intertwined with American history. Today, with enrollment dropping, the small, private college seems to be going the same way as the typewriter, the newspaper and the independent bookstore. While some colleges struggle to survive, the institution of the college town lives in suspended animation, ready to support whatever form its major employer may take. One thing’s for sure: the reinvention of the post-college town is coming. Here in Central Florida, the tradition of a liberal-arts college entwined with a small or medium-sized municipality is alive and well, for the moment. But trouble is brewing. While private institutions in Central Florida may not advertise their funding problems, the truth is plain to see. Rapid expansion of athletic programs, sure-fire profit centers for most schools, is underway at Rollins College, Stetson, and University of Tampa, and all are exploring other ways to reach more students, as well. Florida’s public universities are not immune to budget problems, either. And their response to the financial crisis says much about the future of college towns everywhere. The Economist magazine has compared colleges to newspapers. If their analogy were to hold true, of the 4,700 colleges and universities in the world, “more than 700 institutions would shut their doors.” Citing the rise of massive, open, online courses or MOOCS, the magazine suggested that the idea of a professor interacting face-to-face with students will become a luxury. Colleges seem destined to end up in the same tiresome boat as the rest of the digital world, where everything, ultimately, becomes a product on Amazon. Uncertainty about the future has hastened the liberal arts school’s demise. In the darkest days of the recession we were told there was a STEM crisis: science, technology, engineering and mathematics were the fields that would get you a job. People ditched their liberal arts pursuits for more practical, employable ones, swearing off the indulgent frivolity of a philosophy course for a computer programming class. Panicking parents and students stampeded out of the gothic halls of the English department as fast as they could. Here in Florida, to pay for a new state campus in Lakeland, the Governor gutted the operational budget of Florida’s 11 other institutions of higher education. The new campus, located on rural land adjacent to Interstate 4, is far from any sort of population center. It's a soulless commuter school; any form of a college town to accompany it lies far, far in the future. USF Polytechnic is being billed as a “destination campus”. Its showy new structure nearly complete, it lies naked to the Florida scrub and Interstate 4, with a few lonely stucco buildings and portable classrooms marking a kind of desperate, treeless sense of place in the hot Florida sun. No flip-flop-shod students strumming guitars, debating the meaning of Proust or the relevance of Marx will ever be found under its oak trees or in front of its bohemian coffee shops, because there aren’t any. Instead, there’s a harsh, asphalt parking lot and a long, hot trudge to the endpoint, another signal that one’s college years are just like a shopping trip to Wal-mart. If the one-in-seven death rate holds true, then one of the seven college towns in Central Florida will not have a future either. Gainesville, DeLand, Winter Park, St. Augustine, Tampa, Lakeland, and St. Petersburg are seven places with streets, residences, and businesses that each have grown up around colleges, public and private, and that enjoy a thriving sidewalk life. Ironically, at least two of these colleges were born in another desperate time, the Great Depression. The University of Tampa, across the Hillsborough River from downtown Tampa, started in a failed hotel when the city took it over from owner Henry Plant’s railroad empire. Likewise, Flagler College in St. Augustine began in a resort hotel built by New York railroad magnate Henry Flagler. The small, private, liberal-arts college was a perfect solution. A grand old structure was re-inhabited, and a struggling city was bolstered. Towns that grew up around these places have different, more informal qualities than other towns. In Gainesville, for example, churches, temples, student centers, and other non-profit institutions occupy prominent positions within the urban core. There's a diversity of old houses with garage apartments, lean-tos, and enclosed porches. Wood apartment buildings have side stairs, outdoor beer kegs, and bicycle racks. They sit under huge, mature trees, clad in subtropical philodendron vines, and are connected by narrow dirt pathways carved independent of sidewalks. A sense of grown-over-time pervades within and around campus, its boundaries softened by sneaker and bicycle traffic, concert posters and poetry reading notices. Gainesville, with nearly fifty thousand students, will probably survive, but other, smaller towns may struggle. As conversion to digital learning reduces costs, the college town may disappear. Anonymous reviews, posted online, replace conversations in bookstores. University Avenue may be deleted, just like yesterday’s term paper. Our bookshelves are crowded with titles about the urban future, but in all of this furious scribbling it seems no one has noticed that sidewalks have all but emptied out in many of our cities. Chicago, New York, San Francisco, and a few more still march to the pedestrian beat. But a fairly thorough survey of peninsular Florida yields few sidewalks with any kind of street life — and the few that still operate as shared, social space all belong to our college towns. Students, with one foot in childhood and one in adulthood, still walk on sidewalks. They shop online, too, but they still patronize businesses for the sake of the social interaction, and still have use for the physicality of the street… for a street life that seems to be endangered. College towns, living on today in a shadow of their former bohemian selves, will be reinvented, just as education systems will. But for now, deprived of street life, we breed a different sort of citizen and thinker than an old college town once did. This new digital citizen will construct social space in ways yet to be foreseen. Richard Reep is an architect with VOA Associates, Inc. who has designed award-winning urban mixed-use and hospitality projects. His work has been featured domestically and internationally for the last thirty years. An Adjunct Professor for the Environmental and Growth Studies Department at Rollins College, he teaches urban design and sustainable development; he is also president of the Orlando Foundation for Architecture. Reep resides in Winter Park, Florida with his family. Photo of downtown Gainesville by the author. 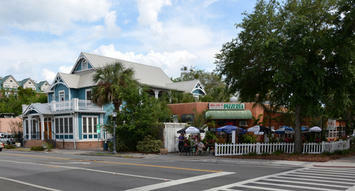 This scene is typical of the streets surrounding the campus of the University of Florida.